With three rows of seating, the Ford Explorer offers versatility. No matter where you're heading, you'll have the space you need and the power to get you there. Standard on all Explorer models is a SelectShift system. This is part of the automatic transmission, and it has six different speeds. If you have a Sport or Platinum, you can take advantage of the paddle shifters mounted on the steering wheel. You can optimize your driving experience with the Terrain Management System. You can let the SUV know what type of ground you're traveling on so it can adjust to the conditions. You'll have the grip and traction needed to be safe on snow, gravel, or sand. 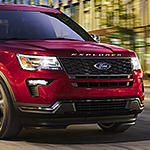 You can sit behind the wheel of a Ford Explorer to get a feel for what it would be like to own one. Visit us at Sutton Ford Lincoln for a test drive any time.